Home→Just For Fun→The Lives We Lost early ARC giveaway! Tell me your favorite character from The Way We Fall, and a sentence or two (or more, if you’d like!) explaining why. I cut and paste the blurb so you understood my comments reasons is it lame to do that lol. GAV!!!!! Hands down, the moment he entered the story I couldn’t put it down!!! 🙂 He’s such a complex character–I really hope we see some more of his leadership in this book! It would have to be Kaelyn, because I like how she reacts, and she is a great main character. The way she acts is totally understandable and believable, and that is what I like in a protagonist! OK — Kaelyn was far and away my favorite character but Tessa was the perfect counterpoint to her. This is one of those books that you must read in one sitting since you will be dying (cough) to find out what happens next. I would adore to get a copy of this so I can say I have read everything you have written. I’m not sure I have a *very* favourite, because I liked Kaelyn a lot, but I was also really intrigued with leo. I agree with what Monica said re: getting a great idea of who this person is, despite not actually meeting them on the page. I liked Gav the best. He completely messed with my expectations. I was really wary of him at first, and then as I got to know him better, I really admired how brave he was and dedicated to helping people. I really like Gav. He is such a selfless character and I love the way he takes initiative to help others on the island. He gives me hope for humanity in a time of crisis because he doesn’t just look out for himself. My favorite character is Meredith. She reminds me so much of my little sister! Kaelyn! I enjoyed following her as I read, and she turned out to be a wonderful heroine. She was smart, quick, useful, and though her world was crumbling around her, she tried her best to stay strong for herself and her family. I loved her. My favorite character totally had to be Kaelyn! I loved how she grew throughout the books, because of everything thrown at her. I really fell in love with her and her strength by the end of the book! How can I pick ONE character? Part of why this book worked so well was the way they all played off each other. I love how Tessa and Kaelyn’s friendship develops out of necessity, but then becomes genuine. I also love Kaelyn’s brother (whose name escapes me at the moment). I want more of his story! My favorite character would have to be Gav because he’s so sweet and so swoonworthy! He was always looking out for other people and taking care of Kaelyn that I couldn’t help but love him! Thanks for the giveaway, too! I thought the development of all of the characters was extremely appropriate in this novel. I will be different and pay a shout out to Kaelyn’s dad. He shows his protective nature when he is trying to save his family, his strength when he is dealing with his wife and daughter’s illness, and his dedication to trying to find the cure. What a guy! I liked Kaelyn! I thought she was a very realistic character and I liked the way she grew as the story progressed. Oooh! I want to know what happens to the family next! I liked the MC’s older brother (I am TERRIBLE with character names! Sorry!) I like how he disappeared and reappeared and hope he is finding a safe way for the survivors to escape the island. I liked Kaelyn best. Since we were reading her journal, she’s the one I cared most about. Although I actually liked Tessa a lot too. I thought she balanced Kaelyn. Kaelyn was my favorite. I felt connected to her the most and thought that her character was really well rounded. I really enjoyed Kaelyn. I felt the most connected to her because of the journal entries. These can be really personal and show the true inner feelings of a person. I really felt like I got to know her character. But also Tessa because she’s fierce and loving and incredibly brave. Tessa. I mean, it’s really impossible to pick, but Tessa was just wow. Her strength, her reserve and her incredible ability to find a way to keep going — I loved discovering her alongside Kaelyn. *yey* i’ve been waiting for this! And about my favorite character… that’s Tessa, I guess. Especially for the natural look. My favorite character from TWWF was by far Gav. I think I enjoyed his character so much because I really didn’t see his and Kaelyn’s relationship coming. When he was first introduced I thought he was for sure going to be the villain so I was happily surprised when I was completely wrong. I LOVE Gav!!!! Theres just so much to him. And his and Kaelyn’s relationship is so real and powerful I just cant wait to read what happens next! I can’t pick just one part from the book I love, but I love K’s letters. They’re super powerful! My favorite character would have to be Tessa. I was totally fascinated by her–from her skill as a gardener to her sense of independence, she is not like any teenage girl I’ve ever met and yet still feels like one that could plausibly exist. Not to say that I didn’t enjoy all of the characters, but Tessa is who I wish I was a little more like! My favorite character..ahh..no brainer, it is Gav! He was such a night in shining armor and sooo dreamy! My favorite character is Gav! I mean, c’mon who doesn’t want a boyfriend like him? Kaelyn is my favorite character. She has strenght and courage, and although she is vulnerable, she grows through the novel and we can see her determination when she faces impossible situations. Tessa!I was so intrigued and fascinated by her. Plus her strength and determination are so inspiring. Kaelyn because she was a realistic, intelligent and likable main character. Gav! I loved that he was so determined to do something good even though most of his friends eventually gave in to violence. I liked finding out his background a little and understanding why he was the way he was. Can’t wait for the next book! I just finished reading The Way We Fall – in one day! My favorite character is Meredith, what a brave little girl going through so much at such an early age. I can NOT wait to read the sequel…will she (fully) recover? will her mother come back for her? (Where did her mom run off too?) As a school library media specialist, I can NOT wait to share your story with my older students! I loved Gav. There was just so much more to him than was apparent at first impression. 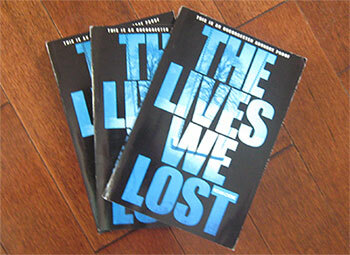 Can’t wait to read The Lives We Lost. Really enjoyed Give up the Ghost as well. My favorite character was Tessa, because she is such a strong person. I really admire how well she adapts to change. Eeeep! What a relief that I came back to the world of blog-browsing in time… otherwise I’d have missed this! Meredith is my fave character. She’s such a well-developed secondary character, and she is sweet and strong. I just want to adopt her! Absolutely GAV! :) He’s so good person, he’s not selfish like, for example, Quentin. He lost his family, his best friend, but he stil have Kaelyn.. I LOVED TWWF. it had me on the edge of my seat the entire time. I cannot wait to find out what happens next. Thanks for the giveaway Megan! Of course I loved Kaelyn since you get into her head throughout the book, but I really loved Gav and Tessa too. I can’t pick a favorite!